Whether you’re starting out or shopping on a budget, we have a range of beds and bedroom furniture to suit you. But rest assured, our Essentials range won’t sacrifice on quality sleep for you and your family. We work with trusted brands such as SleepMaker and Active Sleep to bring you quality beds and mattresses. That’s why we’re Australia’s leading bedding retailer. Essentials are backed by the latest in sleep technology and seeped in history. We're supporting your family’s sleep health, and with a comfort guarantee of up to 10 years, it's a choice based on your needs. 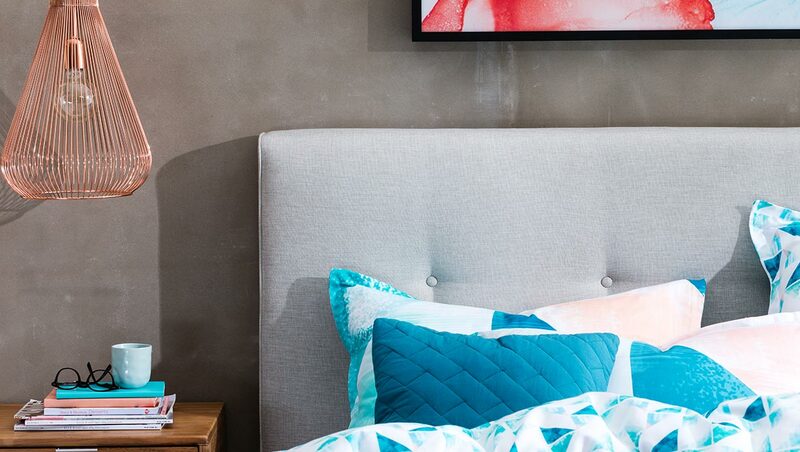 Rest in style and create a calming vibe for your bedroom with our range of contemporary bedheads. Customisable base options plus a variety of fabrics to choose from means you can find a style that suits your design scheme. What makes up a Forty Winks essentials mattress? You don't have to spend a fortune getting a good quality mattress that offers proper back care support and body comfort. We have worked with our leading brand mattress suppliers to build trusted affordable mattresses that don't have to rely on trials and guarantee's. And they don't lose all the features and benefits you would expect from brands like SleepMaker, King Koil, Serta, Silent Partner & Active Sleep. With 5 and 10 year guarantees, proper inner spring mattresses and proven body support while you sleep. Essentially, a great sleep at a great price. Forty Winks’ Essentials are exactly that - something for everyone, at every budget, to make your bedroom sing. Like our beautifully crafted range of bedside tables that take you from the country to the coast or on a global nomadic journey.